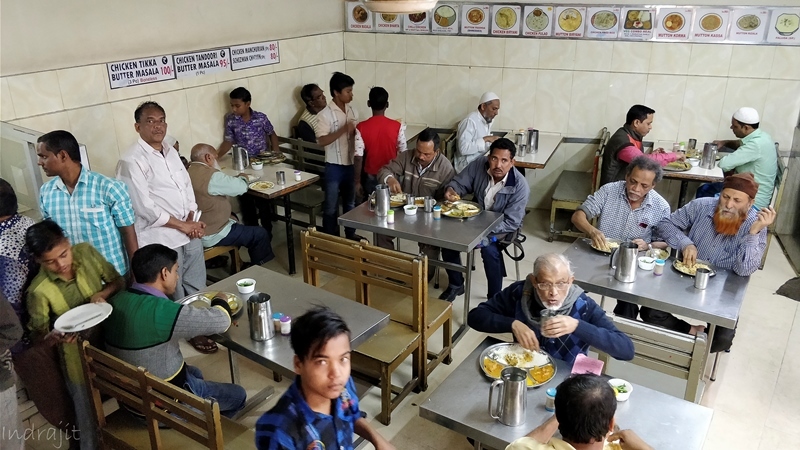 “A meaty foodwalk can only be conducted in Chitpur” – I was proudly boasting to one of my friends when suddenly he quitely told me, “you assh&%$, have you ever been to Tipu Sultan Mosque ” “Ahhh, those falooda shops ? Off course yes” I chirped, and he snapped back “then how can you make such a comment ? 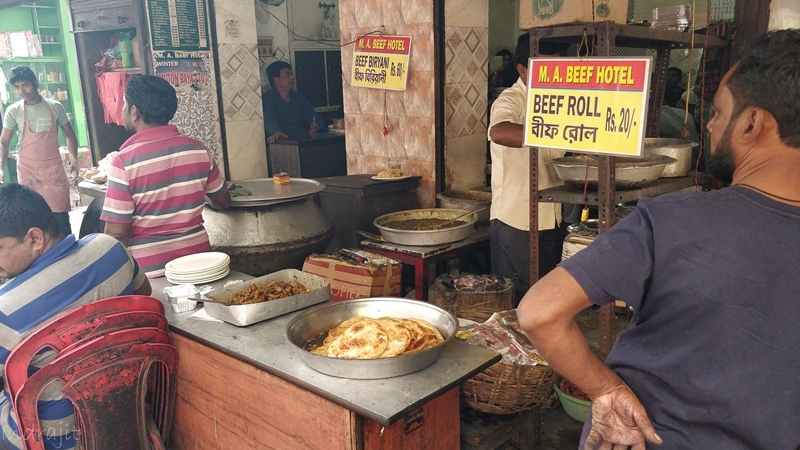 ” And, off started my planning for the meat-foodwalk or meatwalk in the heart of the city. 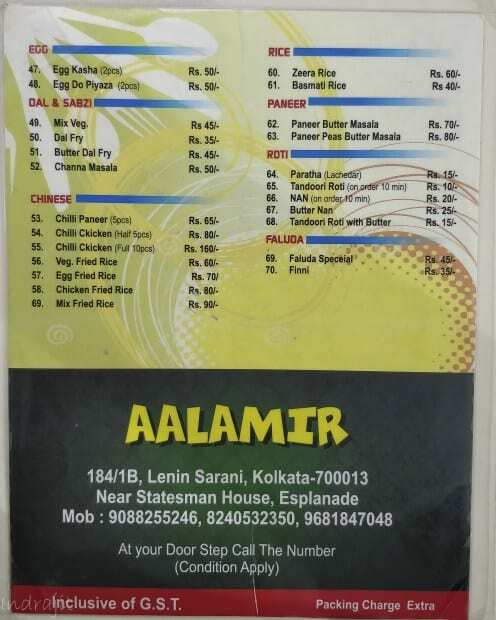 Let’s say, you’re standing in front of The Statesman Building, Esplanade and eyeing for some lovely homo sapiens , on your left, will be lying this narrow lane, always, bursting with people and basically, the Meaty Khao Gully Of Kolkata. 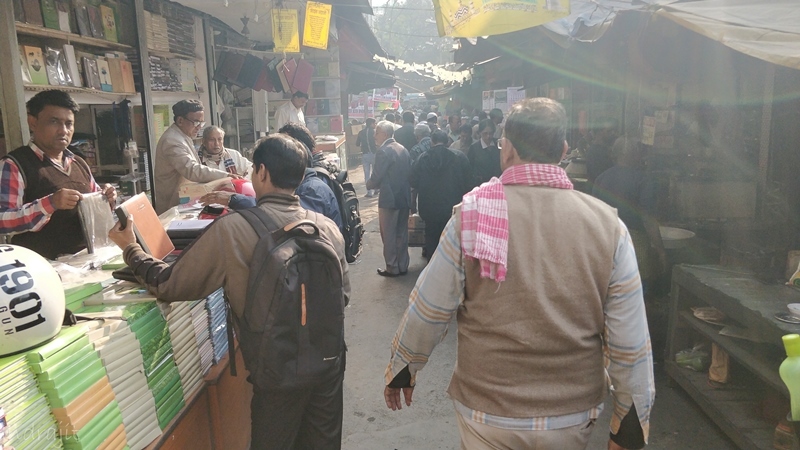 The lane will eventually meet the tram tracks at Lenin Sarani. And, we can and should start the foodwalk from that side. But do remember, whatever you do, for the first time, go there on friday, any friday. 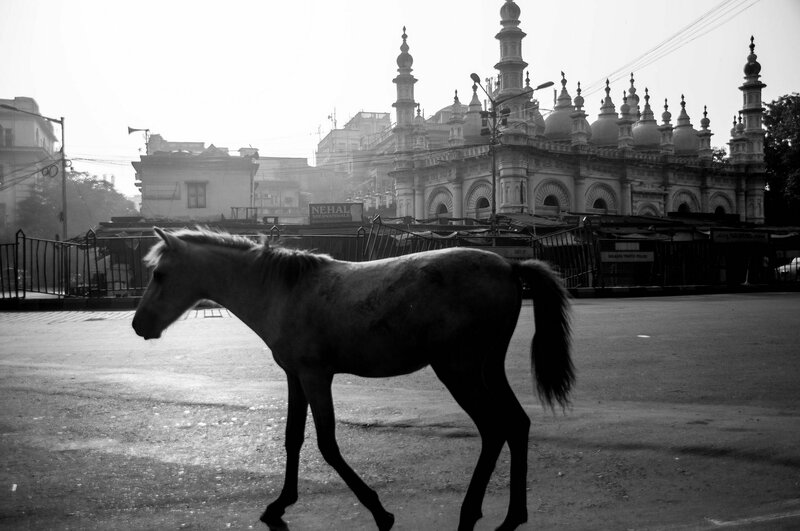 The first hotel on your left, will be Hotel Aalamir. Do not be a miser to save those few bucks and remember to climb up the stairs for their neat AC section. It’s actually pretty neat place. The staircase might be a problem for somebody of my waist-size, but what-the-heck ? 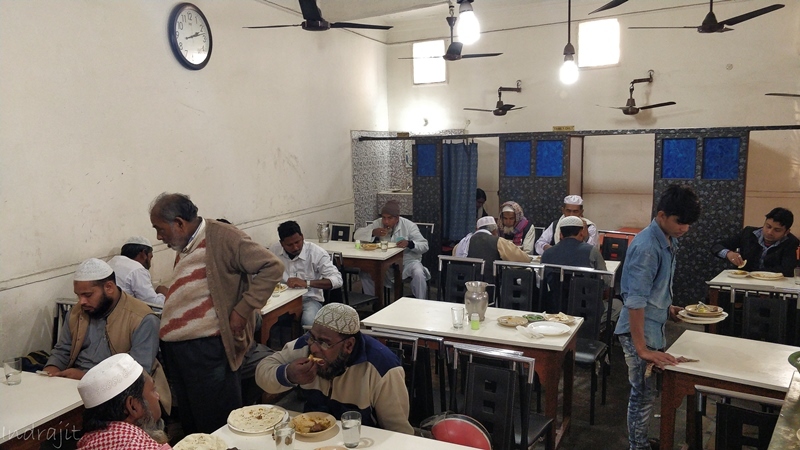 And, while ignoring the stare of the waiter (while asking for the menu card) and browsing through it, order for their Tandoori Thali. At 140/-, this is unbelievable. I won’t say, the taste is heavenly, nor there is no better place making this. 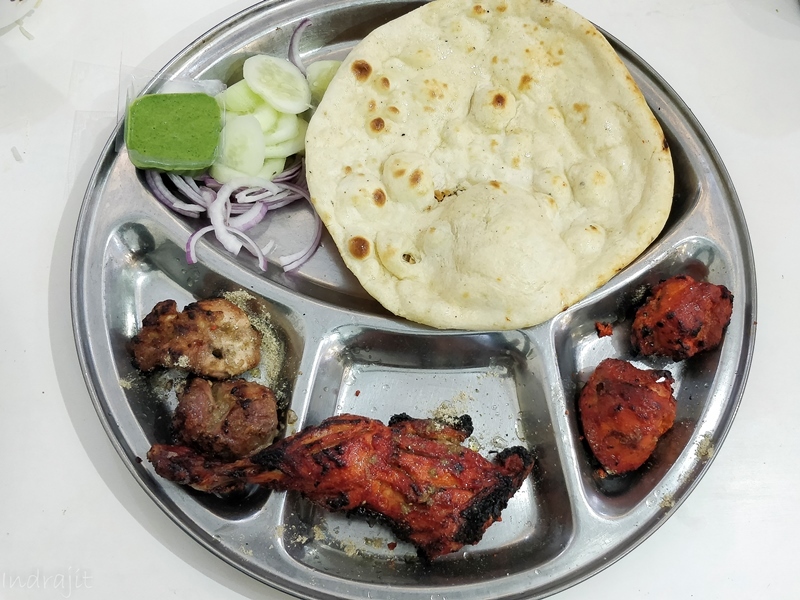 But, there are very few places in town, there they serve 5 fairly substantial pieces of Tandoori meat with salad and a roti- as a combo. 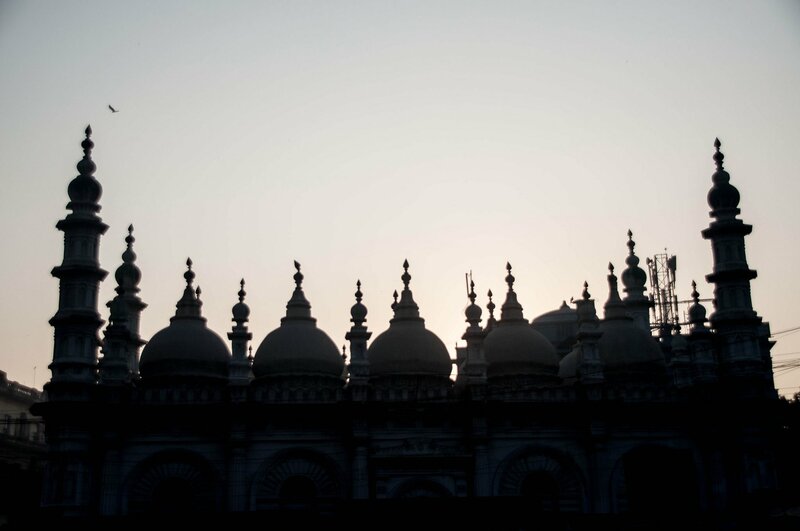 Do not get misguided by their tempting mutton Pulao, we made the mistake. 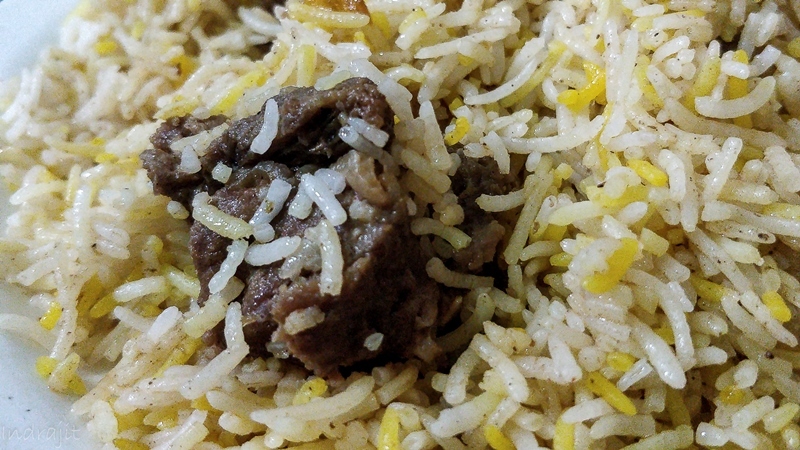 It’s basically mutton and pulao. 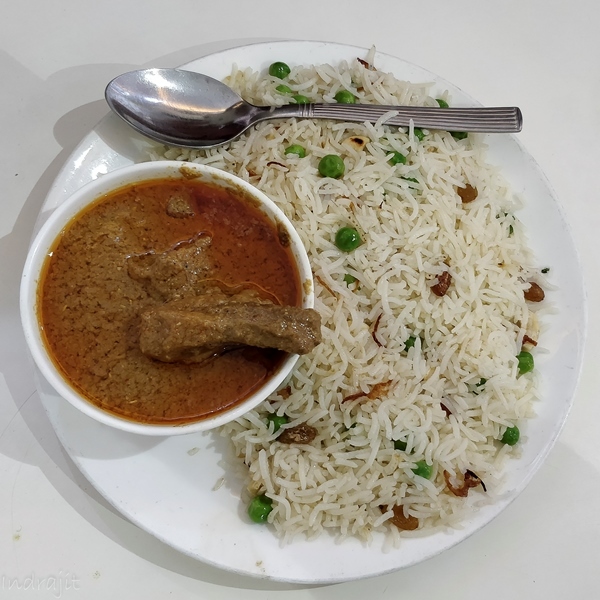 Okay, the pulao is nice and fragrant, and 3 pieces of almost boneless mutton (in a korma gravy) is no mean deal, but at this age, the sound of broken expectation hurts. I know, you’ve brought your friend along and one more plate of tandoori combo is needed, but move on. 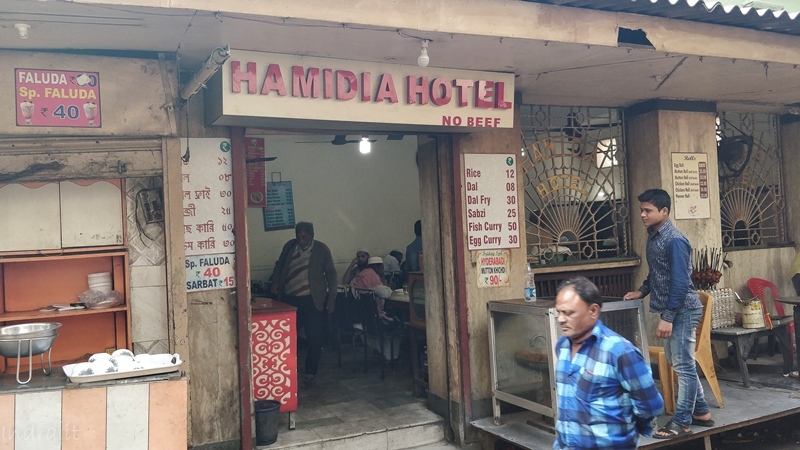 The next stop is just a few shops ahead- Hamidia Hotel. 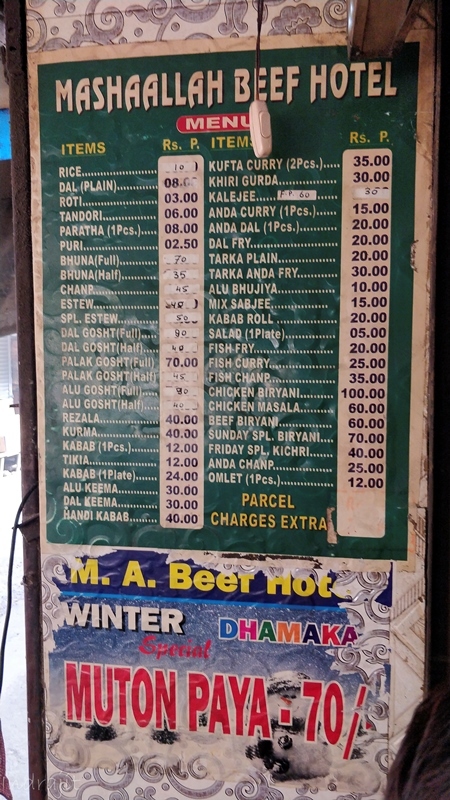 Don’t go by the name, they don’t serve beef, but some nice mutton dishes are guranteed. Inside is a no-frills non-AC seating with god knows why, few cabins thrown in. 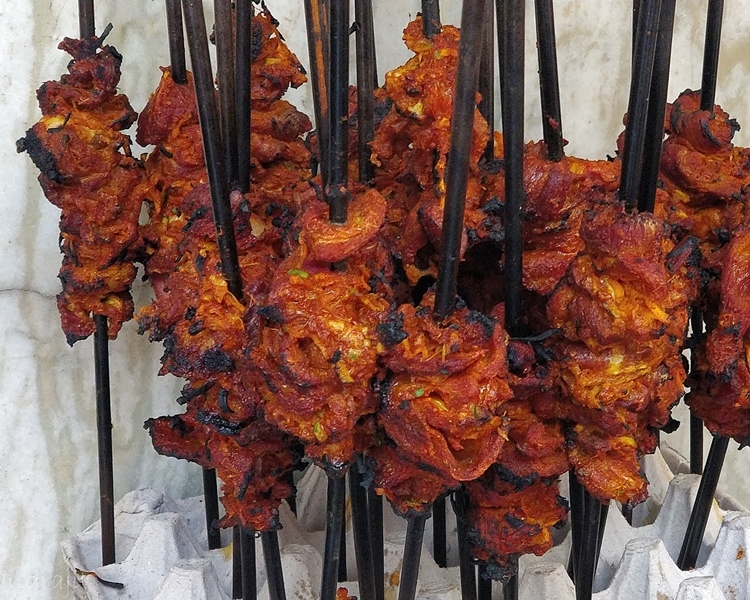 On order, the kebab sheekhs left outside , are sauted on a big tawa with onion, capsicum and green chillies , and the Hamidia version of mutton kebab is produced. 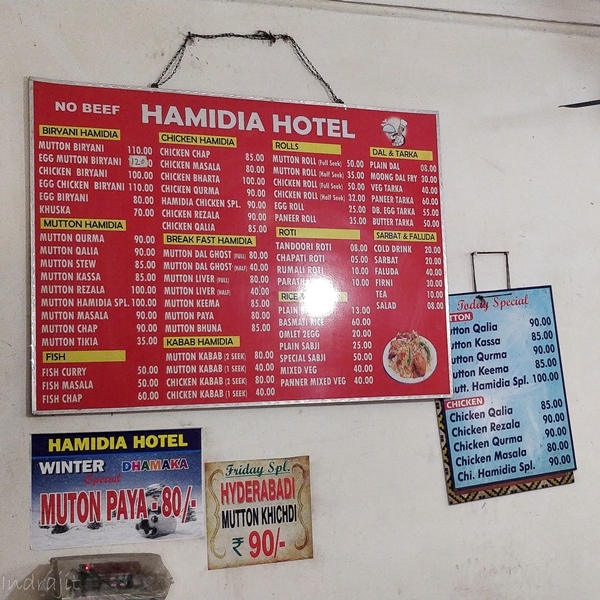 1 portion of kebab is created out of 2 Mutton sheekhs and priced at 80/- a plate. 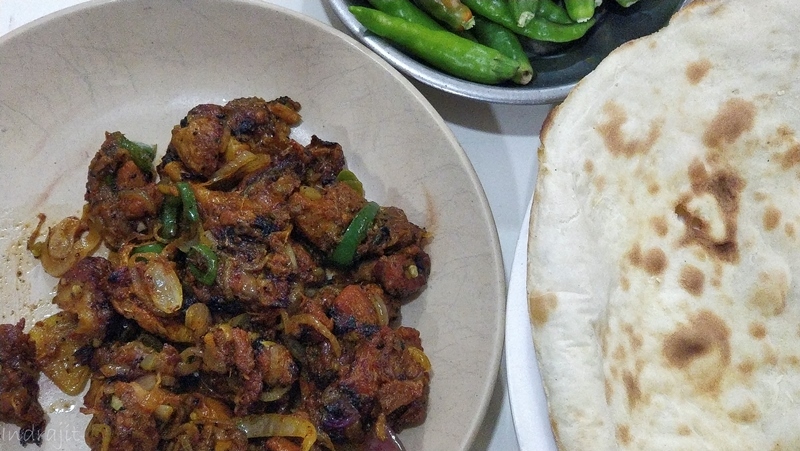 Pair it with one of their Kadak roti, and you’re good to go. Off course, now you must be thinking why I was insisting you to going there on a friday. 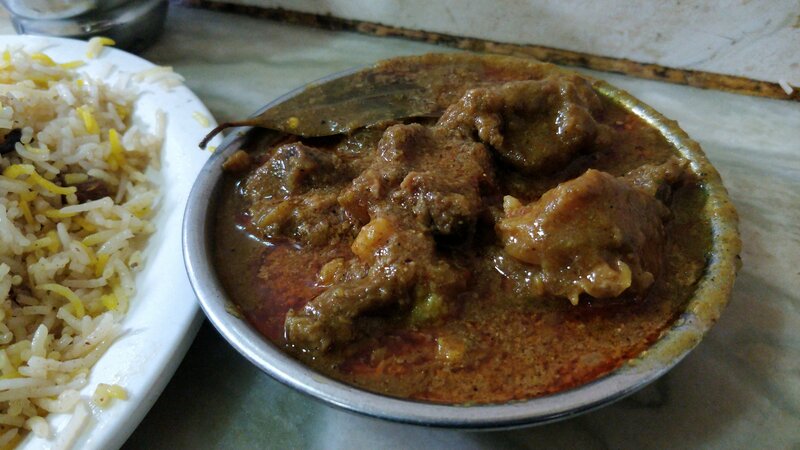 Every friday, they prepare something called Hyderabadi Mutton Khichri. But that’s something you can save for your next visit. Your final stop should the one on your last, when you’ll come out of the gully, on your left- Masha Allah Hotel a.k.a. MA Hotel. It’s a madhouse. 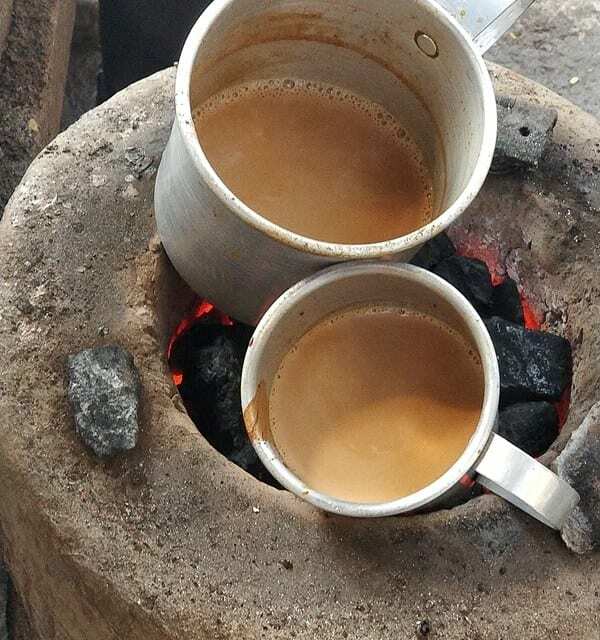 Please imagine, some 50 persons are fighting inside a 100 sqft room and alongside, few gravy dishes are getting prepared. You’ll need the eye of a hawk and reflex of a panther to find your seat, but I am sure, you’ll make it. It’s an out and out beef shop. 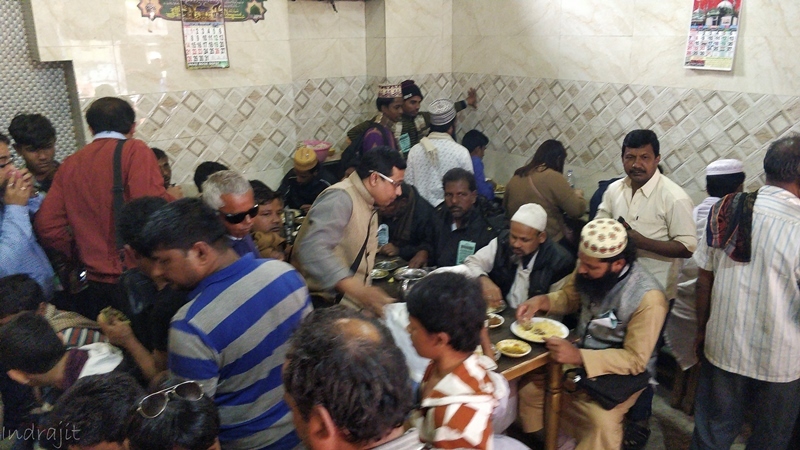 And, by natural instinct of a Kolkattan, you’ll order for their Beef Biryani and Bhuna. 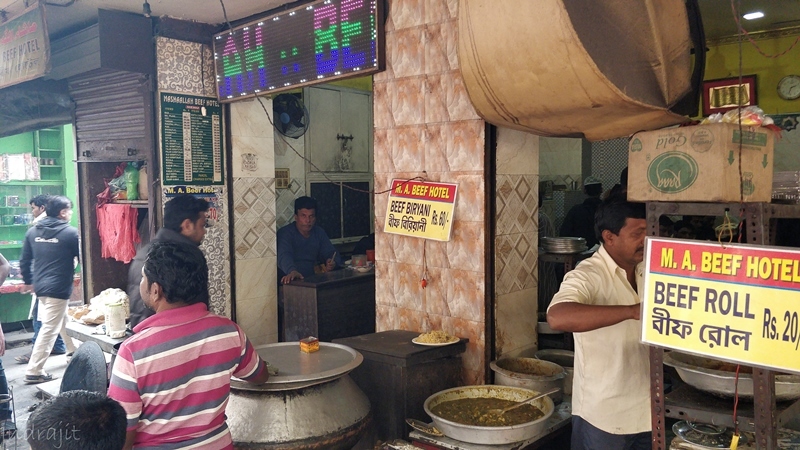 But, only when it arrives, you’ll understand that the biryani is super ordinary and bhuna is basically, Beef Jhol, with a gravy which is still confused it should be called a jhol or kosha. 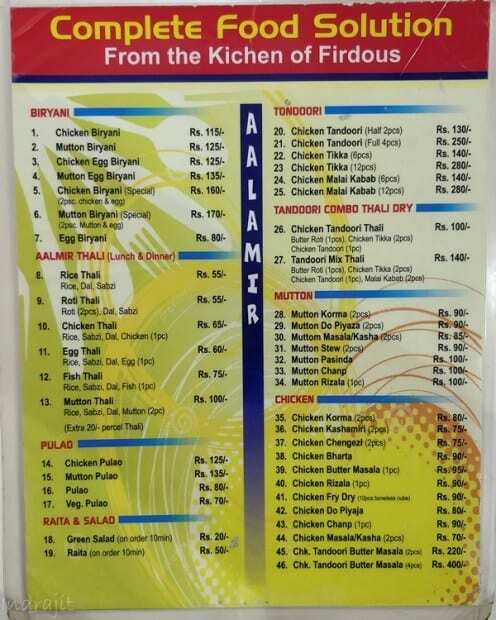 And, just when, you’ll start cursing me, you may like to order for their Gobi Gosht (if in winter) and shalgam Gosht (if in summer). 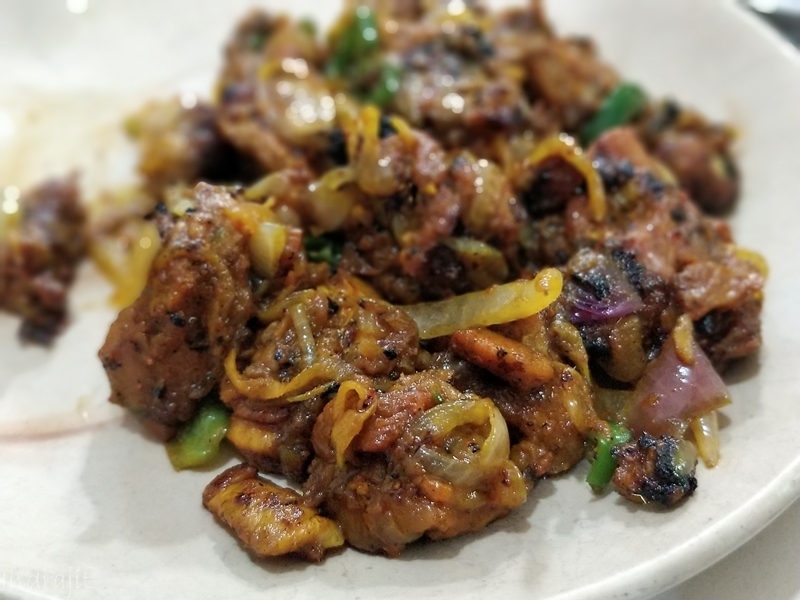 When we ordered for the Gobi Gosht, somehow, on the first bite, we were a bit confused- is it mutton ? The meat is such soft and like a marked idiot, I asked the question to our server. He first stood still for 3 seconds at my stupidity and then answered “saab, beef ka dukan hai, beef hi milega” and I was spellbound. The meat was sourced definitely from the best of the place and texture was super duper smooth. 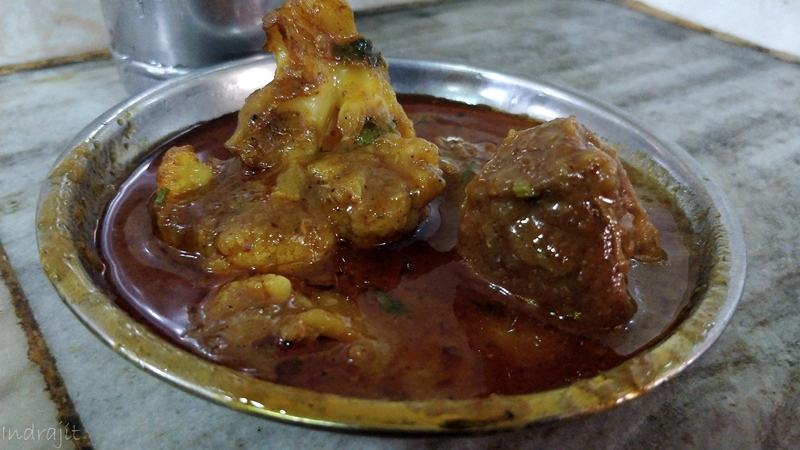 With a large piece of Cauliflower and with a gravy (without the abundance of onion and garlic), it’s just like the bong sunday lunch Mangsher Jhol. This is something, which is definitely definitely recommended. 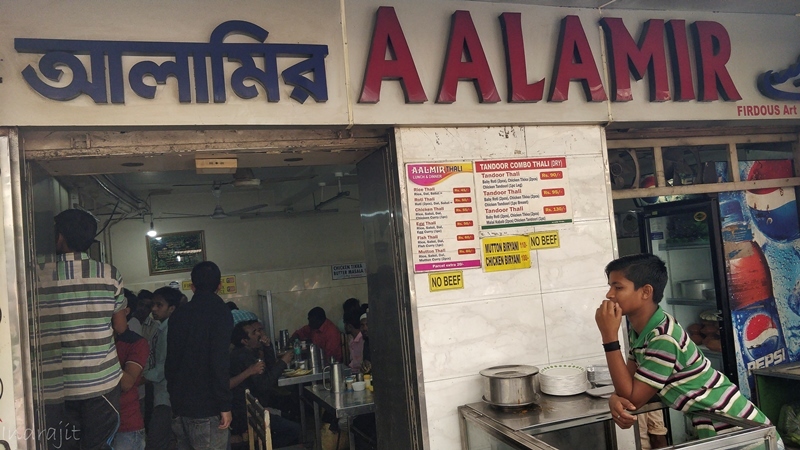 And, finally, when you’re done and if it’s evening time, you might like to go back to the Aalamir hotel to find some heavenly Falooda. Some sweet dish is needed after a foodwalk and what better item than this falooda ? 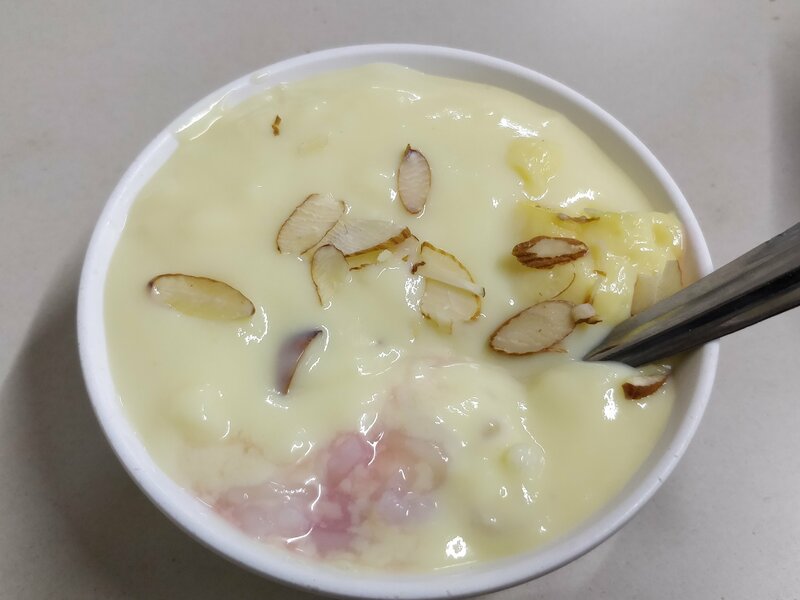 It’s thick custard with rose syrup and some secret ingredients, poured in a bowl in layers and served. Off course, you’ll be given a spoon to wipe it off. 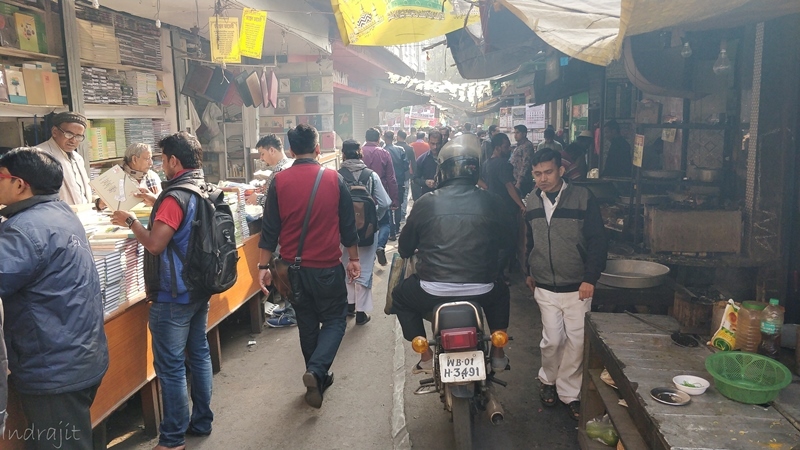 And, thus ends the experience of one more foodwalk in my city of joy. My city never fails to amaze me and frankly, such variety or diversity is rare to find.